Dango, a Japanese go term, means "dumpling shape", and refers to a solid mass of stones without eyes and few liberties - a very inefficient shape. This clump of four black stones is the smallest dango. Adding more black stones to it only creates a larger dango. 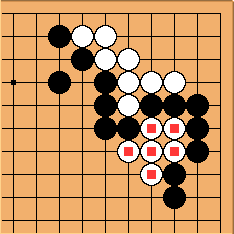 As can be seen from this example, a black four-stone dango may be formed by adding a black stone at the empty intersection of an empty triangle. As an empty triangle is already inefficient to begin with, this makes a dango even more inefficient and makes the problem worse. Here is another example from the squeeze tesuji. The chain is a six-stone dango. Some examples of professional dangos can be found in this compendium. Quacki: Just yesterday, I read my Ranma 1/2 Manga Book (german, Band (volume) 30, I think), which give a translation for dango. It said dango means "balls of fishmeat on a spit" ("Fischbaellchen am Spiess"). Does this have anything to do with our dango? 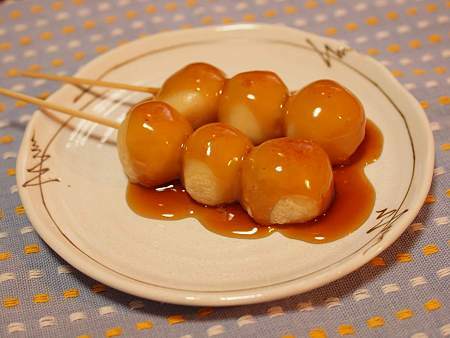 kokiri: Dango are usually desserts, pounded rice balls filled with azuki beans or the like. I've never heard of fish dango, and frankly I'd be a bit suspicious of the translation, but yes the original dango is a foodstuff. Lacrymology: Filled in the japanese kanji. Dango is any ball (food). Niku dango are meatballs, goma dango are mochi (rice cake) balls covered in sesame seeds (goma). I dont know what is the fish dango that they talk about in Ranma, but dango are almost always on a stick, if eaten by themselves (as in oposition to say in some kind of sauce, or whatever), or maybe on a plate with some miso leaves or something wrapping them. In the go, being black and white stones I can see where at some point a big ugly dango like the one up there appeared and someone thought of a dango which by itself USUALLY refers to mochi dango (ricecake-ball) filled with azuki.. black filling, white surrounding it.. nice image for the dango.